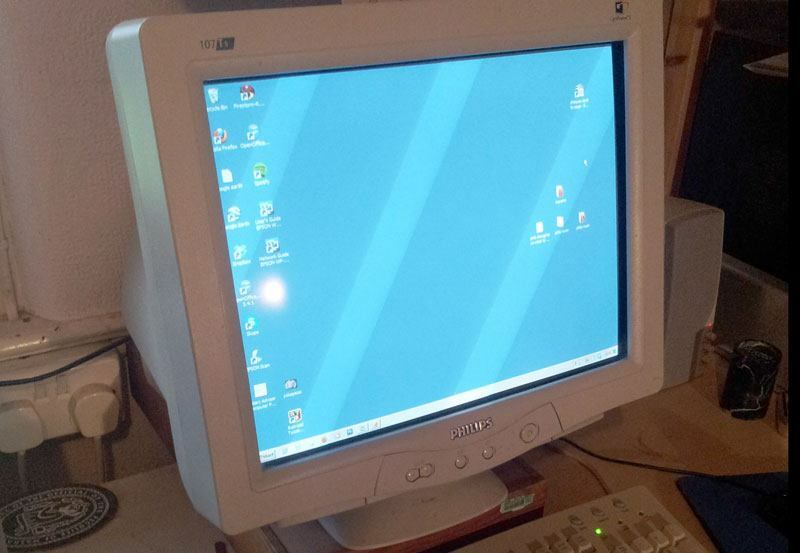 Philips CRT monitor. This was the era of beigeware. old parts made things and built my achievements. They made me money in my business and saw me through most of a degree and a masters. A large part of my online identity was created through them. However how I feel is complex. The much faster start up times of a solid state drives just makes me feel grateful everytime. Ah, but a monitor? I could see that, and I’d spent so much time in front of my old Philip’s monitor, with the classic Sony Trinitron flat screen, that it almost felt like a betrayal to replace it. 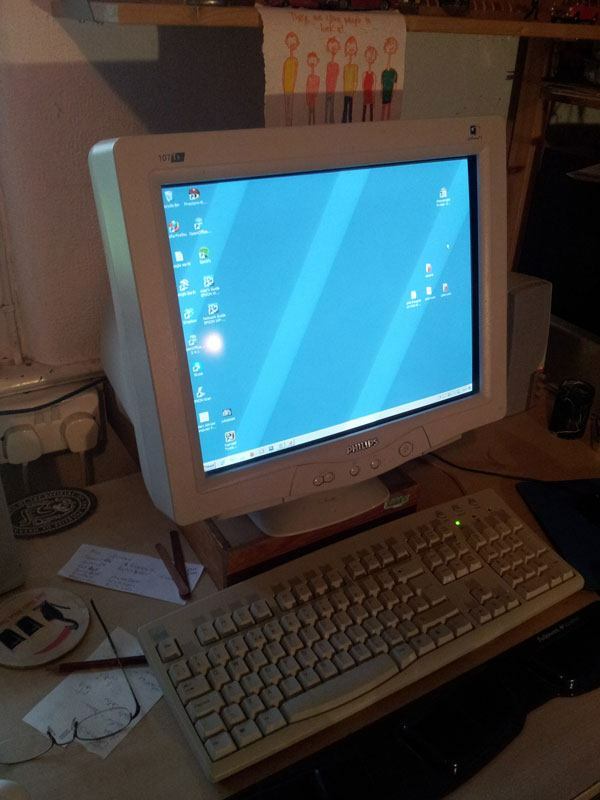 I have spent many, many hours on this desktop machine, morning, noon and late at night, in the concentration of work, in leisure, in joy and in tears. It’s where I watch video and listen to most of my music- the speakers are hifi quality. And because it has been built on over the years, it bears the marks of the past – very much as I do. There’s still a floppy disk drive, kept so there wouldn’t be a gaping void in the front panel, but was disconnected when the last motherboard was installed. At the same time I replaced the dvd reader and cd writer with one dvd writer. A cd/dvd writer had become essential at the time, replacing a Zip disc, and now the dvd writer is barely used, replaced by broadband and memory sticks. There’s even a gap in the back plate of the case, as the original motherboard had both a SCSI card and an audio card. This time, that age worn, scarred box goes too. Is that sadness about being wedded to the past? No, I’d say it’s more about control. I like to choose and customise. I’m not a first adopter (I can’t afford to be) but I build for what I want to do. Over the years, I’ve put together various bits of computer tech because I’ve seen possibilities on the edge of what they can do, rather than being impressed by headline figures of speed and capacity. While I regard my computer principally as a tool to do a job, I get attached to the tools that I create with – which is very much a craftswoman’s or craftsman’s relationship to their tools. And so it’s not just about the tech, it’s also about me. Seven years ago when I last replaced these components I was doing a lot of graphics work, photoshop and desktop publishing. The set up was good for that and since then has done far more than it was intended to do. This new set up, apart from being modernised, takes a step up and will at last cope with the video rendering I’m now doing regularly.